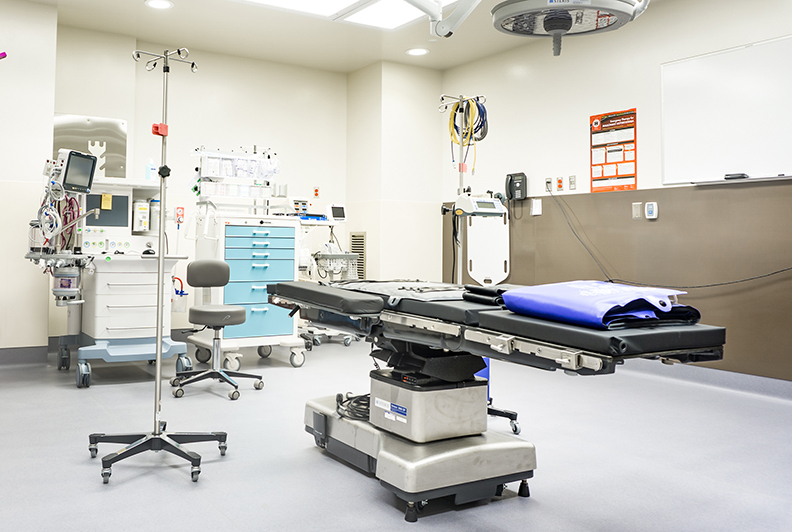 An operating room at the Proliance Center for Outpatient Spine and Joint Surgery in Mountlake Terrace, Wash. The CMS didn’t respond to a request for comment about the new measures it plans to include in the ASC reporting program going forward, but next year ASCs will have two new measures to report on: hospital visits after orthopedic procedures and hospital visits after urology procedures. The orthopedic measure appears to be recognition from the CMS that total hip and knee replacements performed at ASCs are on the rise even though they aren’t yet covered by Medicare. Five measures are currently part of CMS’ ASC Quality Reporting Program, of which one is voluntary. ASCs’ performance on the measures is published on Hospital Compare. Criticisms of one of the outcome measures reported on for 2017—all-cause hospital transfer or admission after an ASC—illustrates the difficulty of measure development. The CMS removed the measure from the current reporting period. The agency also delayed indefinitely the implementation of the Outpatient and Ambulatory Surgery Consumer Assessment of Healthcare Providers and Systems survey, known as OAS CAHPS, from the ASC Quality Reporting Program because of opposition from providers. “We are trying to convince the CMS that our mothers and fathers of Medicare age do know how to email and complete online surveys. We objected to both the length of the survey and that it didn’t have an electronic option,” Prentice said. The CMS plans to test a web-based format of the survey this spring, according to its website. ASCs can also still voluntarily participate in the survey. The CMS publicly posts the results. Considering the scarcity of measures from the CMS, some in the ASC industry have taken it upon themselves to go beyond the agency’s public reporting requirements. For instance, the California Ambulatory Surgery Association, which represents 330 ASCs in the state, has its own benchmarking program. ASCs voluntarily submit their quality data, which is used for quality improvement work. The ASC Quality Collaboration has a similar program that includes data from its 1,600 members. “We ask ourselves how we are doing in comparison to our industry and how can we network to identify ways to do things better,” said Michelle George, incoming president of the California Ambulatory Surgery Association. California’s program is asking ASCs to submit data on measures not currently included in the CMS’ reporting program, like wound infections post surgery, medication errors and excessive bleeding that requires a patient’s return to the operating room. Some 136 ASCs participated in the program in 2017. Although the benchmarking programs are helpful to ASCs, George said it’s still challenging to get an “apples-to-apples” comparison of surgical outcomes across different settings because the reporting requirements are all different. “What we don’t have is the ability to compare outpatient procedures across all the provider settings where the procedure can be performed. A hospital can perform them, then hospital outpatient surgery departments and ASCs,” she said. For health systems with outpatient surgery departments, keeping track of patients’ outcomes post-discharge is a bit easier than it is for independent ASCs, argues Georgia Fojtasek, CEO of Henry Ford Allegiance Health, who plans to retire this year. Some ASCs have forged relationships with local hospitals to try to know when an admission happens, but it isn’t the same as using a common EHR system. The CMS proposed a rule last year to try to make it easier for ASCs to transfer patients to hospitals by removing the requirement that ASCs have a written transfer agreement with the hospital. The rule is still pending. Fojtasek added that she finds it confusing that outpatient surgery centers aren’t required to report the same things as hospitals. “There has to be a requirement that we are all reporting the same measures so we can compare the same things, including the acuity of the patients and the anesthesia class,” she said. Leapfrog is also working on improving transparency of quality information in the setting. The organization last month opened its longstanding voluntary hospital safety survey to hospitals’ outpatient surgery departments and ASCs. Because there aren’t a lot of measures in the space, Binder said Leapfrog started “from scratch” to determine what to include in the survey to assess quality and safety. The survey will ask about volume of procedures, credentials of clinical staff, safety practices, patient experience and structural measures like ensuring there is a protocol to guarantee patient consent. "We prefer outcome measures but there aren't very many," Binder said. "Because there is so little known about ASCs, structural measures will turn out to be very important. We don't have a good understanding of what procedures are performed where." The information from the surveys will be publicly displayed next spring so consumers can compare safety and quality between facilities. Leapfrog doesn’t plan to assign grades to the facilities at this time as it currently does for hospitals. Kathy Nielsen, an occupational therapist with Proliance Surgeons in Washington state, consults with a hand therapy patient. 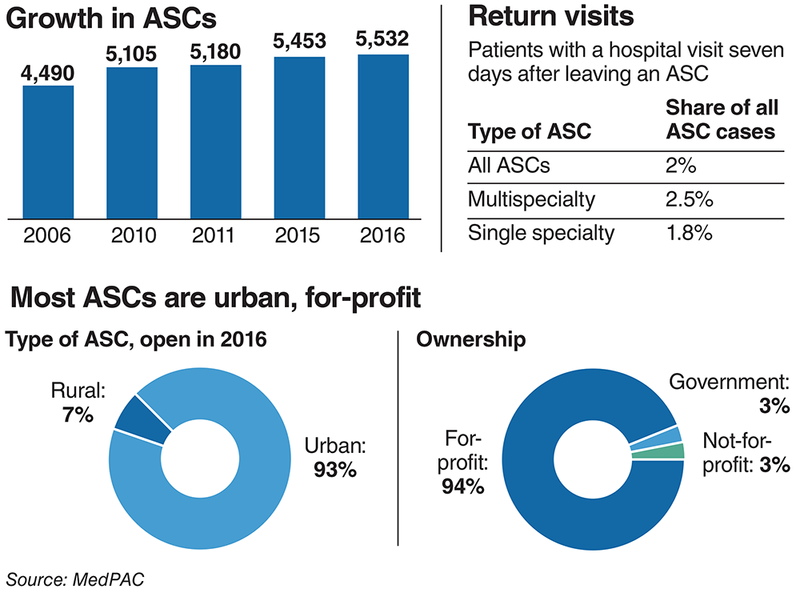 In order to get valuable outcomes data, and instead of only relying on relationships with local hospitals, some ASCs are starting to ask patients how they are doing post-discharge. Proliance Surgeons, a surgical practice with 20 ASCs in Washington state, is currently evaluating patient engagement firms that will allow them to digitally connect with patients before, during and after surgery. Proliance plans to communicate with patients frequently in the hours, days and sometimes even weeks after a procedure to ensure they haven’t experienced an adverse outcome leading to a hospital readmission. The data collected will allow Proliance to better understand where there are areas to improve care and boast about their performance to patients and payers when the data merits it, said Dr. Charles Peterson, Proliance’s board chairman. “What we are doing right now at Proliance, and I think most ASCs are doing if they’re thoughtful, is trying to figure out how do we develop the data collection platforms to measure outcomes objectively and demonstrate them to patients and payers who are thinking about joining us,” Peterson said. The future of quality measurement in the ASCs setting likely will be focused on asking patients to report their own outcomes, said Dr. Gerald Maccioli, chief quality officer of Envision Healthcare, which owns Amsurg, a large ASC operator. A well-developed understanding of patients’ outcomes will allow providers to understand if these surgeries, which are usually elective, actually improve quality of life. But there are challenges to getting there.